Ballina Co Mayo Crowned "Ireland’s Best Kept Large Town in 2018"
Ballina has been crowned “Ireland’s Best Kept Large Town 2018”. The Ireland’s Best Kept Tidy Towns Awards took place today (26/06/2018) at the Harbour Commissions Office in Belfast with delegates from towns and villages all over the island of Ireland. Ireland’s Best Kept Towns competition has been running since 1995. The Northern Ireland Amenity Council initiated the Ireland’s Best Kept Towns competition in 1995 to help raise the profile of both the Tidy Towns and Northern Ireland’s “Best Kept” competitions, and so help to improve the standard of towns and villages across the island of Ireland. The competition is now run by the Department of Rural and Community Development and the Amenity Council in Northern Ireland and is based on participation in the Tidy Towns competition. All entrants were marked against strict adjudication criteria that include cleanliness, the outward appearance of buildings, the presentation of roads and public facilities and the natural environment. Ballina has beaten off competition from Armagh and Monaghan to be crowned Ireland’s Best Kept Large Town. Chairperson of Ballina Tidy Towns Jim Friel has collected the award at the Harbour Commissions Office in Belfast. Hugh Rouse President of Ballina Chamber of Commerce stated “On behalf of the business community of Ballina, I would like to congratulate Mr Jim Friel, Chairperson of Tidy Towns, the Tidy Towns Committee and Tidy Towns CE Supervisor Michael Conlon, the CE participants and all involved in bringing this prestigious and highly sought after award to Ballina. This award is a further endorsement of how far Ballina has come in terms of its presentation for visitors and locals to enjoy, how proud we are as a town in keeping our space clean and how we want to be perceived throughout the country. As a community we must continue to support the hard work of the team behind this award and Keep Ballina Clean”. 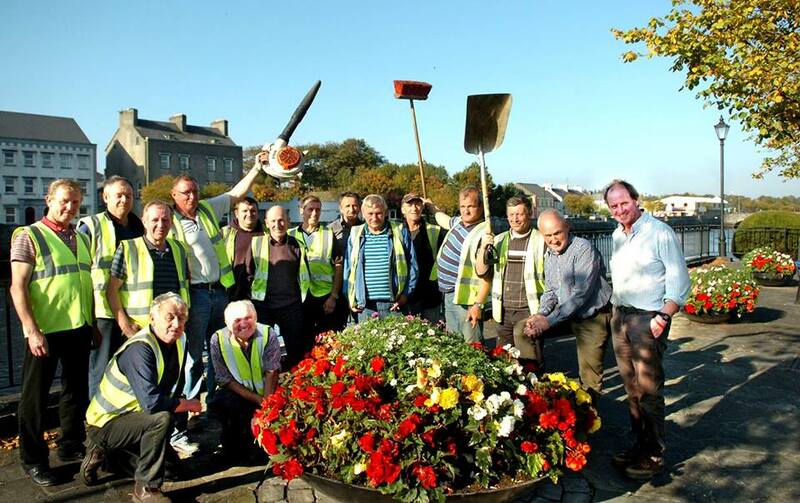 Picture courtesy of Ballina Tidy Towns, featuring Community Employment Supervisor Michael Conlon and CE participants who work hard at keeping our town clean and tidy.